Our wee holiday to the Algarve region of Portugal was our first holiday since moving to Edinburgh. And oh wow was I excited. That excited that I made J wake up probably two-hours too early for our flight. Not only was it our first holiday since moving to Scotland, but it was our first time flying with Ryanair, that notoriously cheap airline, so stingy with their cabin bag allowance they even come down the queue before being allowed to board with a cardboard cut-out of a15kg bag. Though we arrived safely with Ryanair, on the loudspeaker they played this annoying trumpet sound after announcing they landed before the estimated arrival time, probably because they don’t slow down before they try to land. After catching the bus from Faro Airport to the main part of town, we walked through the narrow cobblestone streets to arrive at the quaint tiled* house that was our hostel: Casa D’Alagoa. Once we had checked-in and put our bags down in our room, we went for a walk to have a look around through the old town and at the beautiful coast. We ended the night with making use of the two-for-one happy hour deal with pints of Sagres and the meal of the night, a Portuguese dish, home-made by the hostels own Chef - Nuno - which was layers of chicken and mash potato. It has to be the best meal I’ve ever had in a hostel. 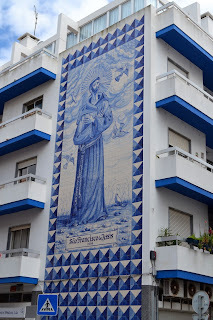 A tiled artwork St. Francis de Assis on the side of a building in Faro. After having the complimentary breakfast, J and I spoke to Marissa (an American girl who lived and worked in the hostel) about the Flamingos that migrate to Faro from Africa. And she told us that she had even spotted a crocodile in Faro once. So after that fascinating tale J and I were ready for some sightseeing around Faro. First off we started by walking down to the marina and having a look at the bay surrounding the Ria Formosa (the nature reserve). Then we walked to the Capela dos Ossos, a chapel from the 19th century, built from over 1000 monk bones, situated behind Igreja de Nossa Senhora do Carmo – a Capuchin church. After that, we went to the local supermarket and bought bread rolls, salami and cheese and these lemon cakes called queques and ate our little picnic back at the hostel on the rooftop terrace. Later on, we went to the Maritime Museum and watched a video on how Algarvean men used to fish Tuna with these giant nets and looked at small-scale models of famous Portuguese ships. After going back to the hostel, we cancelled the next two nights there so we could head to the nearby towns of Lagos and Sagres, and then we played chess and drank beer, right up until dinner. And for that night’s meal of the day, it was a beans and pork dish. Yes, I, Morgan Cranch ate pork. And I have to admit it was pretty tasty. Then we sat and talked with two Canadian girls from Vancouver – Kailea and Whitney - whom we had just met. After checking-out of Casa D’Alagoa, we went to Faro train station; we then missed our train and the next bus to Lagos, and had to wait for another hour. So we sat at the small café opposite the station and read our books and ate some Portuguese custard tarts, which were scrumptious, and probably the best ones I’ve ever had. When our train arrived at 12:40pm, we were waiting for the carriage doors to open (and once they did); we were greeted by a man carrying two buckets of fresh squid. The things you see when travelling. We arrived at Shangri Lagos after a joyful and scenic train ride. We were greeted by the most relaxed guy I’ve ever met at a reception desk, too the point where we were offered a bit of weed. We were then shown to our twin-room, which was across the narrow cobbled lane in another apartment, to the front room, that didn’t have any sheets or bedding and had screws and nuts and bolts all over the table. After checking-in to the hostel, we decided to go have lunch at Mexican café, the Green Room - the hostel had recommended. I had a burrito and J had nachos, which was probably the first Mexican meal we’d had since leaving Brisbane (oh how we miss Guzman Y Gomez). Afterwards we walked to the main beach in Lagos, such a beautiful sight with the North Atlantic’s turquoise water lapping on a sandy beach. We even dipped our toes in the North Atlantic Ocean for the first time, which was freezing cold in May. Then we went back to the hostel (our room had been fixed up, but still no signs of any sheets) and relaxed with the other backpackers and got talking with a guy called Andre, a New Zealand guy that was on holiday from playing NRL professionally in France. When dusk started to fall we decided to hit the bars with our new friend Andre, to our first (and only stop), the Three Monkeys bar that was tendered by an Australian, New Zealander and a Latvian. J and I could see how Lagos’ party scene would be huge in the European Summer, after ordering our cocktails, we were surprised when the bartenders started mixing shots up and passing them across the bar to us, and even having a few shots themselves. Well the night was young. After playing a couple of games of pool against an English couple and having one too many shots, J and I decided to head back to the hostel. Walking back to the hostel in our drunken state, we remembered we still didn’t have any sheets for our bunk beds and had to knock on the main door of the hostel to get some. Then I was sick – those cocktails and shots are lethal. So I woke up with the worse hangover I’ve had since I was at least twenty and of course we had booked a kayaking trip that morning. 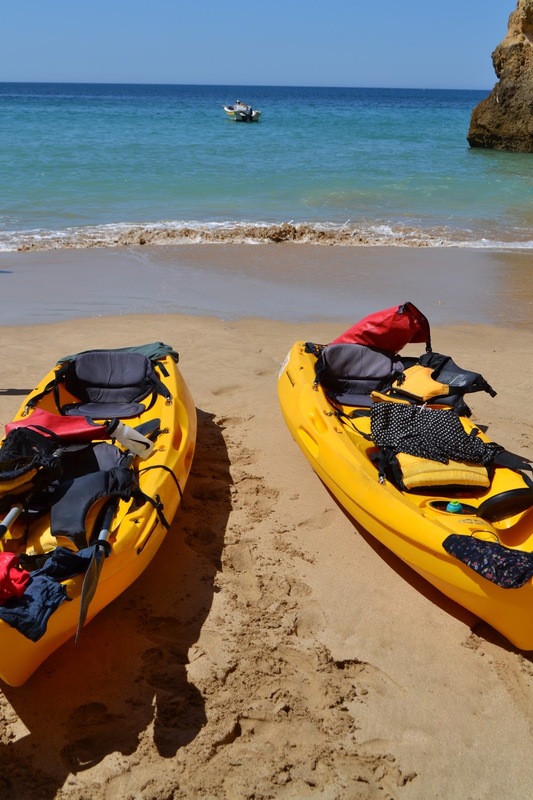 Anyway we surged on and arrived at the main beach in Lagos, for the 10am Kayak Adventures with Sergio. Probably the best tour that J and I have ever done while on one of our adventures. It went for three-hours, where we were told local folklore, went through the beautiful grottos, got some exercise and we got to stop at this private little beach; where we were able to go for a swim. Again the water was freezing, but if you actually swam around it kept you warm enough to stay in there for about 20-minutes. The water was so refreshing for J and I, who hadn’t at the time had a swim since August last year. And coming from Australia we were used to, much more than that. After having lunch at a kebab shop with two girls from Melbourne that we met kayaking that morning, we checked out of the Shangri Lagos and hopped on a bus to Raposeira. After check-in to the Good Feeling Hostel, we went to eat at Casa Pasto Rodrigues (one of two restaurants in the town); where J and I shared a whole BBQ chicken, fries and a salad. That big feed was followed by more delicious Portuguese desserts; peach soaked in a white wine sauce and a coconut and sweet potato tart (a traditional Portuguese dessert); both which were homemade. Then we kept our traveling tradition going and played chess before we went to bed. On the secluded beach during our Kayak Adventures trip. The main beach in Sagres. Our plans for the morning to go paddle boarding with the very surfy host of the hostel, was ruined by the wind factor. So instead we headed into the actual town of Sagres, only 10-minutes on the bus from the hostel. After taking ages to get a bus (they only run every 30-minutes or so) into town, we needed to stop and get something to satisfy our grumbly bellies (because Ellie the Scottish receptionist had forgotten to get stuff for breakfast, I don’t think they’re that busy unless the surf is pumping). We walked down to the Sagres marina to have a look at doing a boat tour and after no success we headed to the main beach to sunbathe; where we were surprised to see two Australian girls, who we met at Casa D’Alagoa were walking down to the beach. After catching the bus back to Raposeira, grabbing our stuff and and catching the bus back to Lagos, we were on the train back home; to Casa D’Alagoa. After walking around town and learning about the Algarvean way of life in the regional museum, we went to the supermarket and bought ourselves a picnic; similar to a few days ago – with salami and cheese sandwiches – though this time we bought Super Bock, another local beer. With our picnic in tow, we caught the local ferry that went passed the Ria Formosa to the Ilha de Barreta, the desert island beach, where we enjoyed our picnic and relaxed all day long in the sun. After an early night, we woke up at 6am for surf lessons at Praia de Faro. The surf lessons were €15 for two hours, and it’s the best surf lesson, I’ve probably ever had. Because these surf lessons were mainly for locals, J and I were the only people in the group that spoke English, so for the instructors to not waste the time of the other people in the group, we were pulled aside and basically got our own private surf lesson. Which was great, because it was J’s first ever surf lesson. Though he didn’t stand-up, he got a feel for the sport. I was the only one out of the whole group who stood up too. It was a great morning, for our last in the Algarve. After that, we were both beat for the rest of the day, though there was still one thing on my mind, trying to find those damn flamingos; though after an hour long walk and returning to our hostel more tired than before – Nuno told us they migrate to Faro in the Autumn time. So after relaxing for the rest of the afternoon, we were ready for one of Casa D’Alagoa’s famous BBQ and Sangria nights, where the Sangria is notoriously made in big bins. Though the sangria was served with Nuno’s family recipe of BBQ chicken, the sangria went straight to our heads. It sucked so very much that we had to get up early due to having to get the right bus, to make sure we were on time for our check-in with Ryanair the next morning. Because we were wanting to party with the Canadian girls and the other people we had met that night, including the lovely staff, that invited us out for more drinks at a close-by locals only bar (which we went along to, but shouldn’t of). Needless to say, J had the worse hangover EVER on the flight back to Edinburgh. One of our last meals in Faro: Pork and clams, at the fresh food markets. *I know I’m extremely behind in writing this piece, especially because I’m writing this when I really should be packing for our holiday to Germany tomorrow. But at least you get to know in a bit of detail what we got up to in Portugal. 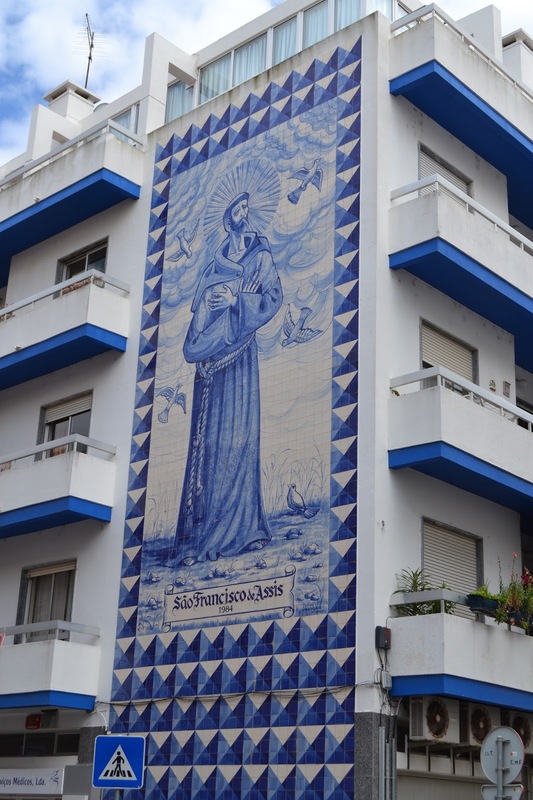 *Faro and a lot of towns/cities in the Algarve region feature many buildings and flats decorated on the exterior with colourful tiles. All l can say is omg pork and clams my oh my Moggs. I have also liked that you have presented your own point of view with this topic, especially while making your points very much clear with this topic. Thank you very much Algarve Surf Camp!